Happy Friday! It’s time for another Five Friday Favorites to see what I have been loving lately! I may not be the typical candidate for a meal delivery since my job is teaching people how to cook more at home, something I actually do very regularly. But I know it is really challenging for many folks to work full-time, take care of a family and pull together dinner every night. I am often asked what my opinion is of any of the new meal delivery companies and I haven’t tried one that I liked until now. 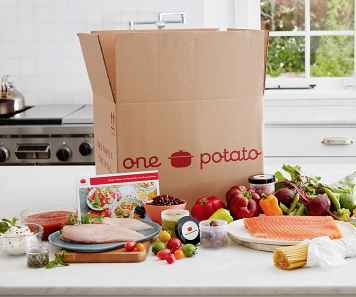 One Potato Box was co-founded by Weelicious extraordinaire Catherine McCord, who is known for her easy and delicious family-friendly recipes. I decided to give One Potato a try last week when I knew I was super busy and could use a little help. On Tuesday, I received 3 meal kits (you can check my Instagram from last week to see what I made) which I prepared Wednesday, Thursday and Saturday. My family and I absolutely loved each meal and preparing them couldn’t have been easier. I received exactly the quantity of ingredients I needed, including already prepared marinades and vinaigrettes. No grocery shopping, and the hard stuff was already done. Everything is organic, which is a must in my book- I don’t want to compromise on quality just because I am getting a meal kit. Second, One Potato is extremely family-friendly- from the meals on the menu each week to the pricing (kid-portion sizes available!) to the cooking instructions. The box is delivered right to your doorstep which couldn’t be any more convenient, and all of the meals can be prepared in 30 minutes or less! Unfortunately, One Potato is not available in all areas. Learn more about One Potato on their website. Catherine is offering my readers a discount if you’d like to give it a try. Use the code PS25. I think this would make an amazing Mother’s Day gift, especially for a new mama! Summer is just around the corner- I can almost feel it! That means lots of BBQs and gatherings with friends, sipping on fun drinks and cocktails. Moscow mules are one of my favorite cocktails — light and fresh with spicy ginger and citrusy lime! To be more specific, the cocktail is made with ginger beer, lime, and vodka, and they are served in a cold copper cup. 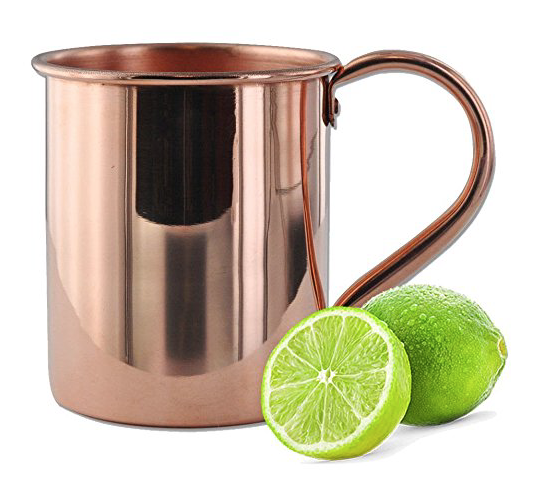 Moscow mules, which originated in the 1950’s, are served out of copper mugs because the taste of copper actually gets infused into the cocktail, enhancing the flavor! There’s a good piece of info to mention at your next cocktail party! These copper mugs seems to be popping up everywhere these days, but you do have to be careful that you are getting a truly authentic copper mug that is not lined or coated with anything, otherwise they will not be effective. Another fun fact is that not only are these copper mugs great for a great cocktail, but ayurvedic practices actually encourage you to drink out of copper mugs to reap the numerous health benefits. Honestly though, that claim is somewhat controversial, so I’m not going to push it. I just think the mugs are fun! These mugs, which I keep in the freezer, can be purchased on Amazon. Because I teach classes to such a wide variety of different people across Los Angeles, I really feel like I have a good grip on what the hot new diets are and what is “in” at the moment. And let me just say that we are a city divided. Many of many students are paleo, and many are vegan — which are kind of the opposite from each other. I fall somewhere in the middle — I eat a very small amount of animal products, and they’re always grass-fed/wild/pastured, but I also try to not overeat grains. I do, however, think that the average American would benefit greatly from swapping out a few of their usual meals each week with a high-quality, nutritious plant-based meal. 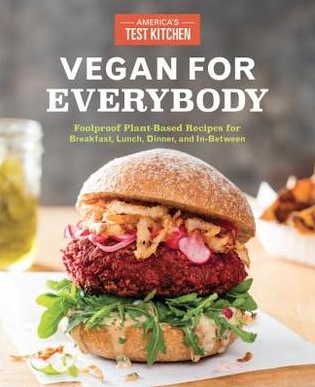 America’s Test Kitchen recently released this cookbook, “Vegan for Everybody,” and the title could not be more fitting. The cookbook is designed to make vegan cooking way more appealing and way less intimidating for the average person who may not necessarily know how to put together a decent meal for their family if there is no animal protein involved. What I love about this book is how in-depth ATK delves into subjects like aquafaba and how to replace eggs with it, how to work with tofu, vegan milk substitutes, just to name a few. Some of the recipes are not new, but most of them are. I can’t wait to start cooking from it! The book is available on Amazon or signed copies are available from my local bookstore, Pages. If you hang around here much or attend my classes, you have probably heard of Thrive Market and perhaps even have a membership and shop from there. Thrive Market is a subscription-based shopping site with many of the products I buy at Whole Foods, but heavily discounted. I found out recently I was one of their first customers and I continue to order from the site once or twice a week and I have saved a bundle! 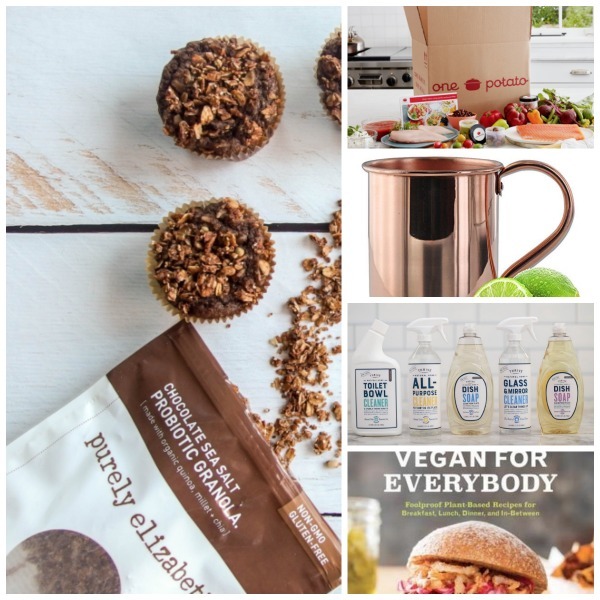 Recently, Thrive Market created their own private label for foods like almonds, cacao powder, sunflower seeds, and sprouted brown rice, all of which I have been buying and loving. Great products at a great price — hard to beat. 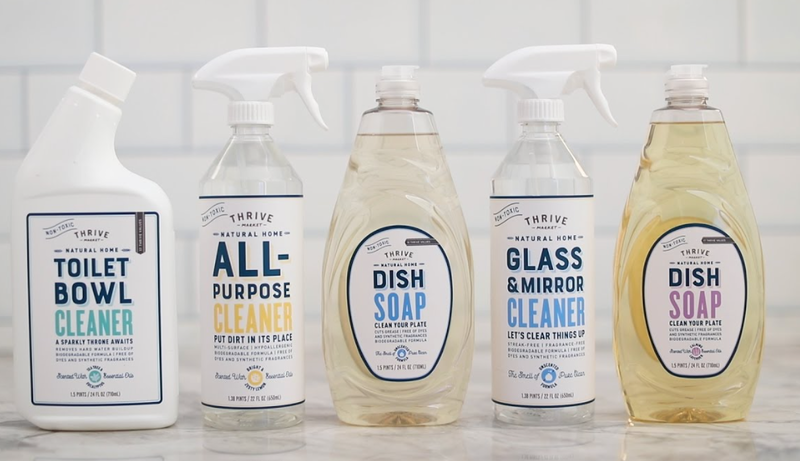 Even more recently, they started carrying their own line of non-toxic, environmentally friendly household cleaning products, and I am crazy about them! Just as we want to make sure the foods we eat are as ‘clean’ as possible, we also need to be aware of what is in our cleaning supplies as well. These products from Thrive fit the bill and are effective, too. They have dishwashing soap, all-purpose cleaner, toilet cleaner, and glass gleaner, all at a great price for a high quality, non-toxic product. I bought and love them all. Check out the products on the Thrive Market website! Quite frankly I don’t know whether you are going to love me or hate me for this next favorite of mine. This granola is so insanely delicious and addictive, I seriously cannot be left alone with a bag of the stuff. 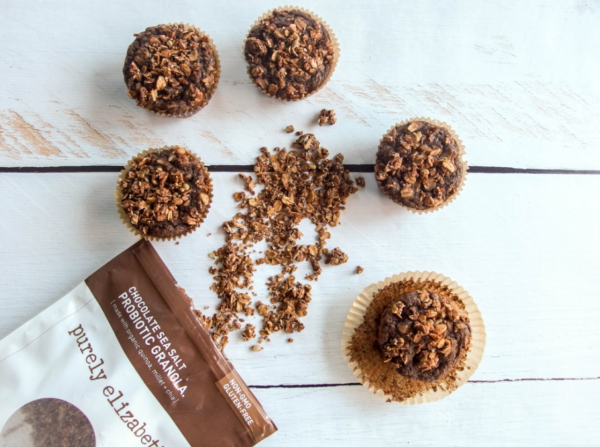 Purely Elizabeth is a company that hit the scene a few years ago with really high quality, clean, gluten-free granolas. In addition, they are vegan and are sweetened with coconut sugar. But what made these granolas really blow up is that not only are they more healthful than most packaged granolas out there, but they are absolutely delicious! However, this chocolate one is worlds above them all, as well as any other packaged granola I have ever had, that’s for sure. I mentioned the clean ingredients, but this particular flavor is also enhanced with probiotics, which aid in digestion and help us achieve and maintain a healthy gut. The idea of adding probiotics to baked goods like this is pretty genius- I am always a fan of a good nutrition boost into snacks and treats we would be eating anyways. And to be honest, I think most people can use some extra probitotics in their diet. Purely Elizabeth granolas are available at select grocery stores, on the company website, and on Thrive Market. The company has also expanded and makes several other products- check them out here! The posts above are not sponsored in any way. I was not paid for the mentions above – not that I would mind getting paid ;). I did receive free product samples from a few companies, but the opinions expressed here are my own. I receive many free product samples, most of which you don’t hear about for obvious reasons. I am always looking out for you! I’m going to post my own chocolate granola recipe soon! I have a question – do you ever do Friday Favorite requests? What about one for “what to bring back from travel’? (other than health, amazing memories, and photos). We’re going to Italy at the end of June and if you have any “try this and this” ideas I would LOVE them. Just thinking ahead since many of us travel over the summer. Thank you! Thank you for these wonderful suggestions! I always look forward to your Friday Favorites! Do you have a favorite recipe for Moscow Mules? I am ordering the mugs for a Mothers’ Day gift for myself. Do you have a brand of ginger beer that you recommend? Thanks for helping to keep my family healthy! Yes! I like the Q brand of ginger beer. I use this recipe: http://qdrinks.com/cocktails/moscow-mule + I muddle some fresh mint in there, too. Enjoy and Happy mother’s day! Delivering organic goodness one plastic bag, bottle, ice pack, liner and cardboard box at a time, carbon footprint not included? No, thanks. A disposable society is a losing proposition, so no meal kits for me. I don’t care how much can be recycled, don’t use these materials in the first place. One Potato’s website provides instructions, but really, all that effort for one meal, for one family, in one city in one state? The family meal is important, but so is our planet. Believe it or not, I totally agree with you. We use way, way, way too much plastic! I wrote a blog post once about ways to re-use, rather than recycle. I was given a meal kit from another company which literally packaged every single item in plastic — 1 garlic clove, 2 teaspoons of maple syrup, etc. At least with One Potato, the red bell pepper was loose and not in a bag, the cucumbers were loose, the marinade and salad dressings were already made and each individual ingredient wasn’t packaged separately. I really thought about this a lot and when most people go to the grocery store, they take a plastic bag for all the vegetables they buy, meats are wrapped in plastic and so on. I personally reuse plastic produce bags over and over. That said, I don’t think it’s perfect, but I do think One Potato has its benefits for people who just need a break every now and then, who cannot find the time to cook as often as they like, who get takeout every night and just need a bridge towards cooking more at home. Thanks for your reply. I’ll accept the idea that it works for people who need a break once in a while. Thanks, Ann. These days there are pros and cons to literally everything.